While it may seem really fancy, red velvet cake is essentially a chocolate cake made red using either natural or artificial red coloring, and has a cream cheese frosting. Though red velvet cake has been around since the early 20th century, it really seems to have exploded in popularity in the last few years. Now there’s red velvet everything everywhere. It seems like everything that can be made red velvet, is. It’s even spinning off into blue velvet and green velvet cake mixes. 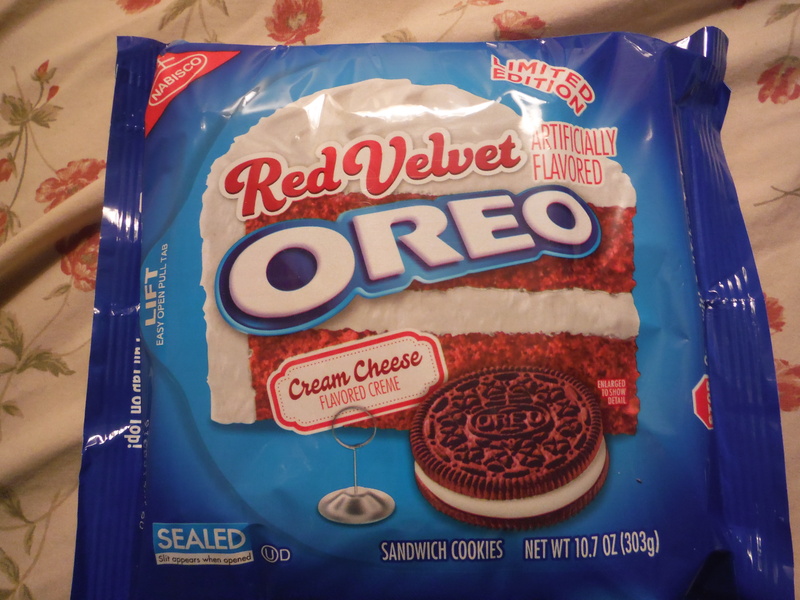 Just in time for Valentine’s Day, a day of love and things colored red, Oreo decided to jump on the red velvet bandwagon by releasing limited edition Red Velvet Oreos. 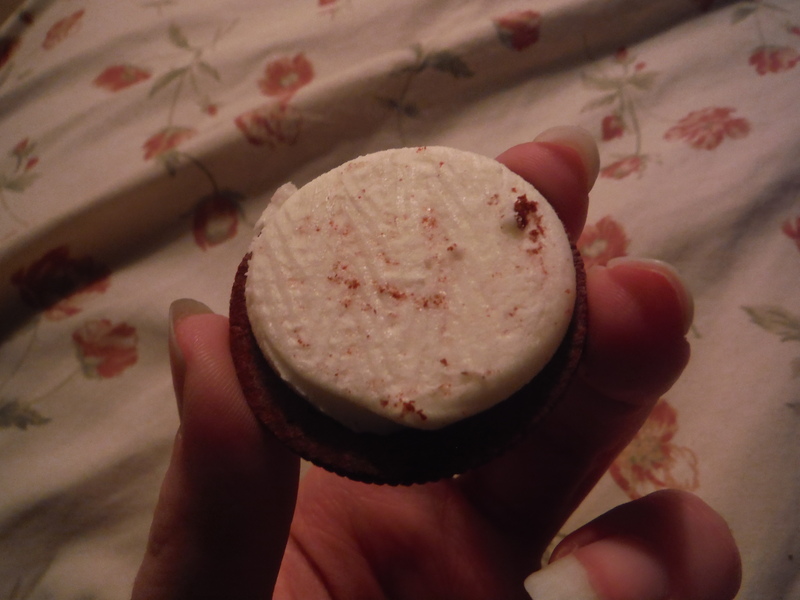 They feature a red chocolate cookie with cream cheese flavored crème filling. So, how did they do? Opening the package we were greeted with the smell of cream cheese frosting. A good sign. The cookies aren’t as red as they appear on the package. They’re really more of a light brown with a hint of red than the rich red most red velvet cakes are. At first I thought perhaps this meant they didn’t use artificial coloring, but alas, this is not the case. Upon first bite, it seemed they captured red velvet cake pretty well. It tasted a lot like eating a crunchy piece of red velvet cake. Unfortunately with further eating things went a bit downhill. The best part is definitely the cream cheese flavored frosting. It tasted yummy and was also a bit creamier/softer than the normal crème filling, which I liked. The cookie part itself was kind of disappointing however. Despite the fact that red velvet cakes are chocolate cakes, the cookies of the Oreos actually seemed less chocolaty than regular Oreos. But the cookie part will turn your dipping milk pink if you eat enough of them in one sitting, which is kind of fun. 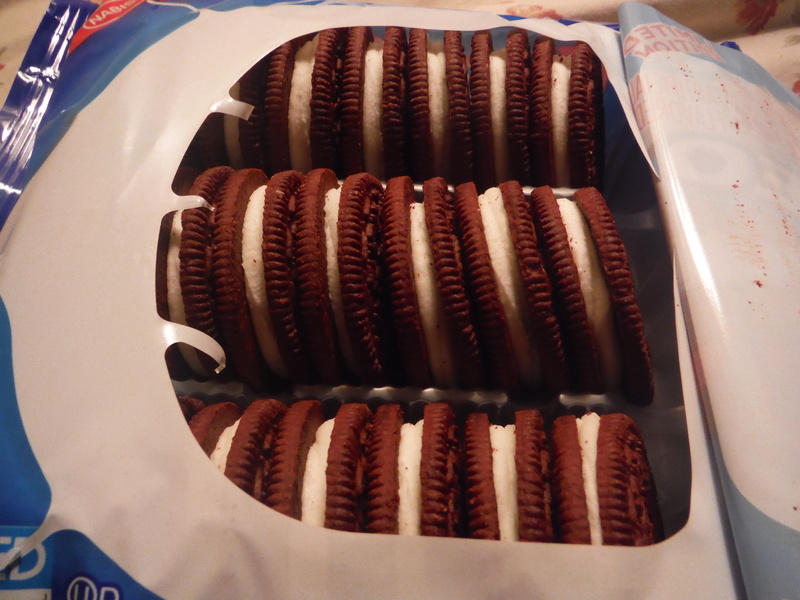 Perhaps the most disappointing/negative aspect of these Oreos is that the package is smaller than a regular package of Oreos, but cost the same price. I don’t know about you, but I don’t like paying more for less. To sum up: Fairly accurate red velvet cake flavor, but it’s probably cheaper just to make a red velvet cake. Want to try them for yourself? Follow our Amazon Associate link! 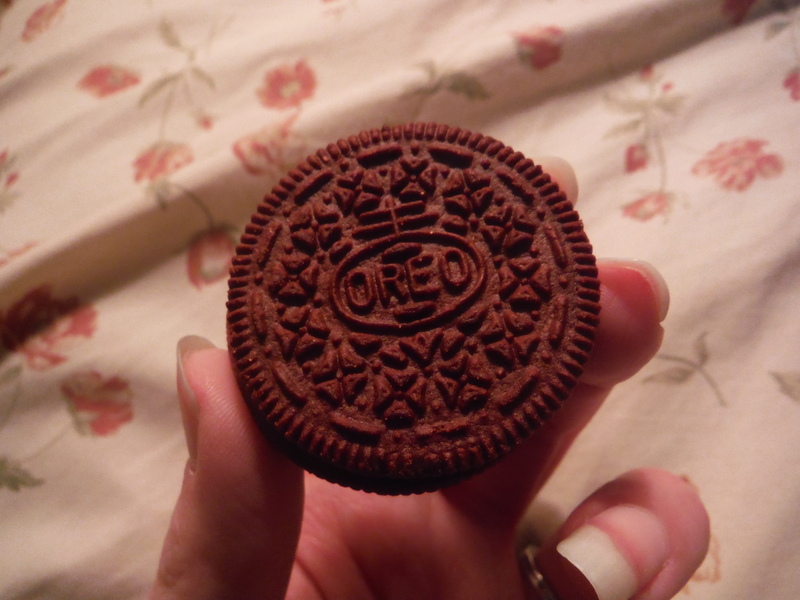 Should you eat Red Velvet Oreos? Only if you can get them on sale. Posted on February 12, 2015, in The Snack Report and tagged cookies, crazy crossovers, dessert, Oreo, review, snacks, yummy. Bookmark the permalink. 2 Comments.